Order your book from our website and receive a personally autographed copy! 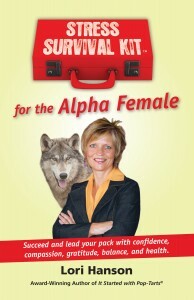 The Stress Survival Kit™ for the Alpha Female is an entertaining yet practical guide for the overstretched, overcommitted, take-charge female. Blending traits of the alpha female wolf with her human counterpart, this book inspires you to lead-not by emulating masculine behavior-but by incorporating your feminine strengths and being authentic. The second in the Stress Survival Kit™ Series, this book is packed with powerful, easy to apply tools for dealing with the stress of day-to-day life. It’s a great reference guide you will return to daily for inspiration, techniques and affirmations. Each topic has a tool kit; everything you need to keep you B.A.L.A.N.C.E.D. Get your personally autographed copy today. The Change is the fastest self-development series in the world. 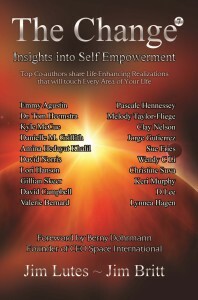 Lori was invited to be one of 20 co-authors in this inspirational book. With each chapter written by a different author there are many stories, angles and flavors that will inspire and motivate you to be the change. This book holds something for everyone. Get your personally autographed copy today. 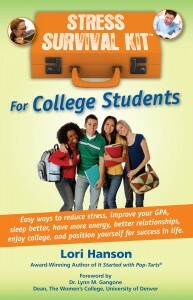 Stress Survival Kit™ for College Students is short and packed with powerful yet easy to use tools and techniques for dealing with the stress of college life. This reference guide is one you will refer to often to reduce stress, get you unstuck and back on track. Are you stressed out from school, SATs your schedule, after-school activities, relationships and pressure to perform? Is it hard to talk to your parents and teachers about it? You need to read this book! 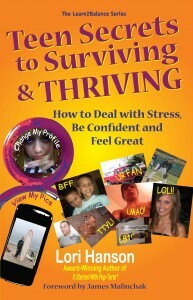 Teen Secrets to Surviving & THRIVING is a practical, upbeat, down-to-earth guide that is a quick read for teens to help them navigate their teenage years with confidence. The author packs this short book full of great stories, humor and addresses serious issues in a positive and encouraging fashion. Hanson’s Hot Pastry Principles provide teens with easy to use tools to “deal with stress and frustration, communicate with confidence, believe in yourself and enjoy your life everyday. It Started With Pop-Tarts®… at the age of 14. Lori Hanson struggled with bulimia for 34 years. Her expertise comes from life experience. After a bout with counseling in her twenties, Hanson looked for ways to heal on her own. She discovered the power of the sub-conscious mind and her alternative/holistic path to recovery and healing began. 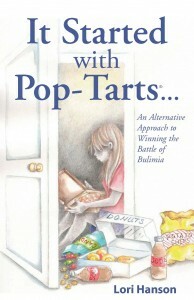 This book is written to provide inspiration for individuals who struggle with eating disorders and to enlighten loved ones to the depths of this obsession. Hanson shared her five strategies for recovery.